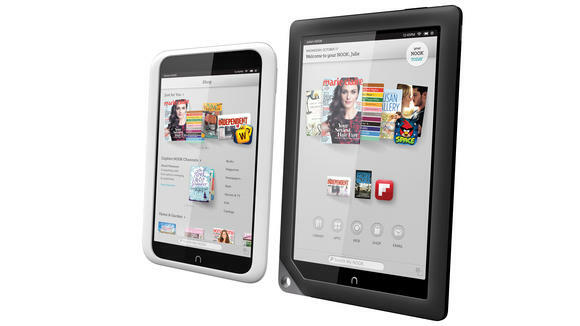 The Nook HD and Nook HD+ are two of Barnes & Noble new tablets that hope to give Kindle a bit of competition. They come in sizes 7-inch and 8.9-inch, the same as the Kindle Fire HD and the Kindle Fire HD 8.9. Barnes & Noble have been trying to get at Kindle ever since the big move to e-reading – Amazon lead the path with Kindle, and Barnes & Noble, being a brick company for many years, had to start chasing them down. One problem with Barnes & Noble is their software; we have always found it a tad hard and less user friendly than the Kindles. While this may just be a matter of opinion, more people still choose to use Kindles rather than the cheaper Nook e-readers on offer. On their new line of tablets, they have really tried to make an operating system and user interface that even the most illiterate of users can use. The operating system is Android Ice Cream Sandwich, at its core, although Barnes & Noble redesigned the UI quite significantly, the same as Amazon have done with their Kindle Fire tablets. All this is fine, but the problem is that many users are claiming their tablet is very laggy.Techradar&The Vergehave both commented on the sluggish user interface in their reviews, saying that sometimes the tablet won’t load for a few seconds, which is just unacceptable against the competition. While this may just be a simple software error they need to update, Barnes & Noble have had this problem for a while and when showing it off pre-release, they blamed it on the device being a prototype. They have not commented on the poor speeds since then. Until they release a software update to ratify this error, we could not say this would be a very enjoyable experience for users. We are unsure if this is effecting all users, our idea is some may get away unscathed, but many are reporting this error.